The vehicle that cars want to be in another life, that which laughs at weather capable of leveling whole civilizations, a ride so cool as to shatter penguins – nothing is more fun to drive than a truck. The 2017 F-150 is easily the nicest truck to be had. While it has a box in the back and a wheel at each corner, almost nothing about the current F-150 is quite what it seems. The body, for example, is aluminum rather than steel, which makes the machine substantially lighter than its iron ancestors, and impervious to rust. Actually, the designers of the current F-150 appear to have invoked every trick and incantation they could think of to reduce its weight, which has rippled through other elements of its construction. The 3.5-litre V-6 engine that we ordered for our F-150 generates almost as much horsepower as the 4.6-litre V-8 in our previous truck. However, in that it’s pulling a much lighter vehicle, it very nearly achieves low Earth orbit when it’s asked to accelerate. The truck also handles much more responsively than its predecessors. 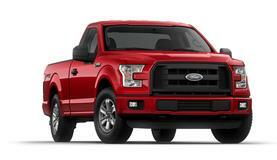 There’s a larger V-8 engine available for the F-150, should you be beset with a trailer to haul. Long have I regarded trailers as the tools of unclean spirits, and I don’t tow. The six-speed transmission in our F-150 is flawlessly matched to its engine, and this is the first truck I’ve owned that doesn’t want to bang its drive train when it’s accelerating up a grade. It shifts smoothly under any driving conditions. The transmission allows for switchable tow and sport modes, which adjust its shift points to provide for more low-end grunt to drag a trailer and for better performance at speed, respectively. I’ve had no cause to try the former, for the reasons discussed a moment ago – sport mode feels like it’s too much fun to be entirely legal. The F-150 is available in a disturbing number of permutations, from a simple work truck all the way up to the Lariat and Platinum trim levels, with leather seats, moon roofs and Jaguar-level pricing. We sprung for the XL, the base-model truck, and added several packages to it to make it a really sweet ride. Specifically, the power equipment group got it power windows, doors, air conditioning and all the other amenities of a passenger car, and the sport group swapped its chrome-plated bumpers and trim for parts that matched the rest of the truck. One of the less-than-optimum features of the F-150 is its selection of factory tires – or perhaps, the lack of same. It can be had with all-season radials or all-season-radials with fancier treads. Off-road tires are not available, and this is something of a drawback where we live, as a lot of what we drive on could reasonably be described as off road. Actually, most of our actual roads are so poorly maintained as to qualify as off-road as well. We resolved the tire issue by persuading our dealer to exchange the nearly-new off-road tires from our previous F-150 for the factory tires on our new truck. As an aside, our dealer filled our newly-mounted tires with nitrogen at no cost – it’s my understanding that most new vehicles hit the road this way. Presumably, they’ll want to charge us to maintain the nitrogen when the truck is serviced. In the event that you ultimately decide to buy a Lamborghini Huracán supercar, rather than an F-150, and subsequently drive it flat-out on the German Autobahn, nitrogen-filled tires will arguably avail you of better pressure consistency and handling. If there’s an instrument capable of measuring the effect of this option for a pickup truck at highway speeds, it’s not available this far north. Air, which is 78 percent nitrogen right out of the sky, works just fine. The only accessories we added to the new truck were a plastic bed liner and a hard tonneau cover. With the advent of its all-aluminum construction, several competing truck manufacturers have observed that steel is stronger than aluminum when it finds itself under a truckload of lumber or bricks. It’s a reasonable observation, but as most truck owners install a bed liner, it’s somewhat irrelevant. Aside from being more resilient than either metal, if you do manage to damage a bed liner, its replaceable. Ford offers an UnderCover hard one-piece tonneau for the F-150 that’s a wonder of engineering. It’s made of rigid ABS plastic rather than fiberglass, and it’s so light as to be removable by one person and hung on a wall when it’s not needed – or when you want to truck something that’s taller than the box. It locks securely, and its lock can be keyed to the ignition key for the truck, so there’s one less key to lose. It’s available pre-painted to match the rest of the vehicle. The ignition key for our new F-150 was arguably its only really disappointing feature. A large plastic fob with a spring-loaded “switch blade” key that emerges from it, it’s awkward to carry and preposterously expensive. Unlike earlier key designs that kept the security electronics in a separate fob, this one combines them. At least at the moment, it precludes carrying a spare “wallet” key, to avoid being locked out of your vehicle, unless your wallet has backpack straps. Several locksmiths I’ve spoken to have suggested that they anticipate being able to create conventional chipped keys for the 2017 F-150 in the near future, hopefully addressing this shortcoming. The interior of the 2017 F-150 is a personal faster-than-light spaceship. Our truck has a standard cab – two seats followed immediately by the back window. Those seats are available either as two independent seats and a center console or as two seats and a center console that folds down into a third seat when it’s needed. We chose the latter. While you probably wouldn’t want to move three adults in this configuration for a substantial distance, it’s a worthwhile option for short hauls. Those are really comfortable seats. The dashboard of the F-150 is unspeakably cool. While it has traditional, easy-to-operate analog gauges for the speedometer, tach, fuel, oil pressure and so on, there’s a configurable display screen between them that can provide your choice of driving information. Unlike earlier F-150 dashboards, which required that their drivers drill down through innumerable menus by tapping something close to Morse code on a single protruding button, the driver’s display screen on this truck is managed through a key pad on the steering wheel. I hasten to add that you’ll almost certainly want to configure it when the truck is parked, rather than playing with it while you’re driving. The various display options have been well thought out to provide everything you’re likely to want to see while you’re on the road without the necessity of changing screens or settings. A trip mileage counter – it also displays the duration of the current trip. The estimated distance ‘til the tank’s empty. There are a number of useful diagnostic screens that can be displayed in the dashboard monitor as well – once again, to be used when the shift lever is in Park. It will, for example, draw the outline of a truck and show you the exact pressure in each of its tires. This is way more useful than a red light that appears when the tire pressure has dropped to an unsafe level and you’re half a day into the bush. The steering wheel of our truck has a lot of stuff on it, but it’s been situated to make it easily ignorable when it’s not needed. The speed control switches are easy to get at, and there’s a control pad to work the radio and CD player, obviating the need to disengage your eyes from the road and desperately change channels if the classic rock station starts playing Beatle songs. There’s also a control group to actuate the truck’s Sync voice command software. Sync will let you operate a smartphone entirely hands-free, by speaking to it. This is both genuinely safer and it evades the cell phone legislation in most jurisdictions. Regarding smartphones with about the same level of esteem as I do trailers, we haven’t done much with this feature. The sound system that was installed in our F-150 is decidedly awesome – cranked up, it has tectonic bass, ear-bleeding volume and remarkable fidelity for a dashboard radio. It provides a second display screen, in the center of the console. I hasten to add that we contented ourselves with the basic radio and single-CD player. More elaborate sound systems are available, including a Sirius satellite radio. The 2017 F-150 includes a USB port, which is just so unspeakably civilized. It can be used to charge phones, power a GPS and… possibly its best trick… turn the truck into a giant aluminum iPod. Fill a flash drive with MP3 music and plug it into the USB port – the sound system will play it like a CD on steroids. It will even display the track names on the radio’s display screen. The USB port supports an interface for a more conventional iPod as well. Plug one in and it will play through the truck’s radio, with access to its playlists through the dashboard display panel. The F-150 will upload a Ford logo to your iPod’s display for as long as it’s connected. The web page for the F-150 stated that the sound system we chose includes an auxiliary 3.5mm audio input jack. It doesn’t – if you need to plug an analog sound source into the radio, as we did for our Garmin Montana 600 navigation system, a USB-powered FM transmitter is a workable resolution to this issue. There are two conventional twelve-volt power ports in the dashboard of our F-150. The truck is available with an optional 400-watt 110-volt AC inverter built into it as well, which we chose to pass on. While handy if you need to run a laptop or other small electronic devices, this option is more expensive than an external inverter to plug into one of the aforementioned power ports. The area behind the seats of our new truck was somewhat smaller than the post-seat real estate of its predecessor. We store a substantial amount of stuff back there, and it required some rebagging and strategy to make everything fit. This issue is exacerbated to some extent by the tire jack being bolted to the floor right behind the passenger’s seat. Our new F-150 is unquestionably the sweetest truck I’ve driven, and its XL trim level and a few timely manufacturer’s incentives made it among the most affordable. It’s quick, responsive, agile and red enough to be seen from space. It’s every bit as comfortable as a car, but infinitely more useful. Its simple black grill and total absence of chrome make it look intimidating and devoid of pretension. While our truck hasn’t been subjected to a boreal winter as of this writing, its handling on our medieval roads suggests that it will laugh at foul weather. Its switchable four-wheel drive feels like it could climb the side of a building. This is unquestionably the ride of the gods – independent, self-reliant northern gods with a decent pair of boots and suitable outerwear. If you need to go trucking, accept nothing less.